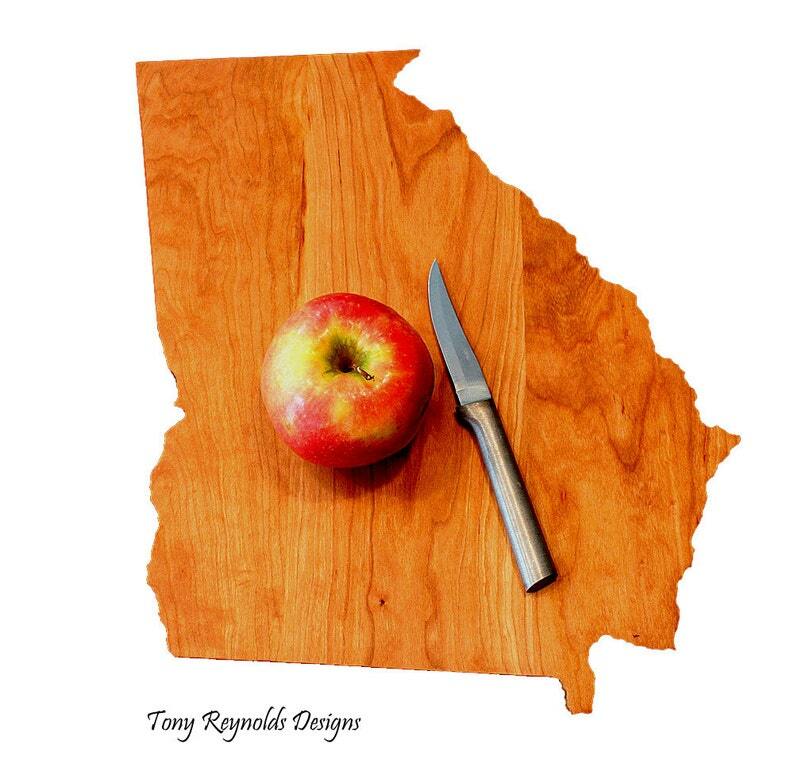 Our Georgia personalized cutting board makes a great handmade gift idea for Weddings, Christmas, Birthdays, Housewarming, or just about any other gift giving occasion. We can also personalize your cutting board with a name and or a date. Please select the desired option from the variation drop down box. Be sure to add the required information to the notes section of your order at checkout. We can add either a heart or a star icon located at the city of your choice. You must select one or the other from the drop down box at the time of order. Tell us the location you desire in the notes section of the order on checkout. If one isn't selected or you don't tell us where you want it, your board will be shipped without an icon engraved. The heart or star is included at no extra charge with your board order. Our cutting boards are handmade, heirloom quality and made from beautiful solid Cherry hardwood. It measures approximately 14″ by 12″ overall and is 3/4″ thick. The finish is 100% FDA approved as food safe. We use our own special blend of mineral oil, beeswax and carnuba wax to seal the board and give it a beautiful luster. Handmade by Tony Reynolds Designs in Granville, Ohio USA. It ships with care instructions in a nice white box suitable for gift giving and or wrapping. Care of your custom wood cutting board is very easy. Simply wash the cutting board with soapy water using a sponge or rag and rinse off, then towel dry. NEVER allow your cutting board to soak in water or place in a dishwasher as this could cause damage to your cutting board. Every month or so you can apply mineral oil or our own oil/wax finish to the cutting board to keep it looking great for years to come. The photo is representative of the quality of the cutting board you will receive. Wood is a natural material and slight variations in grain and color will result. Please allow for those variations when ordering. We use only the highest quality hardwoods when making our cutting boards. All of our cutting boards are made by special order, so please allow 10 to 14 days for your board to be custom made from the time you place your order. We ship via USPS Priority Mail which typically arrives within 3 days of shipping. We also custom make cutting boards for all 50 states for the same price. If you don’t see your state listed yet use the “Convo” form in the menu bar and drop us a note requesting your state. I bought this as a Christmas present for my mom, who decided a few months ago that she wanted to have cutting boards for every state we had lived in while my dad was in the military. This arrived in a timely manner, and the edges are really nice and sharp. It's an exact replica of the outline of Georgia. I am very pleased with my purchase and might have to come back here for the next few. One down, ten more to go! Great board and customer service!